Was born and raised — itinerantly — in the USA and the UK: his parents are academics. He has had two radio comedy series and a pilot TV series, and is currently working on screenplays for two feature films and the BBC adaptation of Clive Barker’s Weaveworld. Only Forward was his first novel, Spares his second. He is distressingly young. An unpredictable, poignant, and captivating tale for readers of all ages, by the critically acclaimed author of Only Forward. There are a million stories in the world. Most are perfectly ordinary. Hannah Green actually thinks her story is more mundane than most. But she’s about to discover that the shadows in her life have been hiding a world where nothing is as it seems: that there’s an ancient and secret machine that converts evil deeds into energy, that some mushrooms can talk and that her grandfather has been friends with the Devil for over a hundred and fifty years, and now they need her help. The publishers have kindly allowed me to provide a small extract from the book…. Imagine, if you will, a watchmaker’s workshop. In fact, please imagine one whether you wish to or not. That’s where something’s about to happen, something that won’t seem important right away but will turn out to be – and if you’re not prepared to listen to what I’m saying then this whole thing simply isn’t going to work. Imagine that thing I just said. If it helps, the workshop is on the street level of an old and crumbling building, in a town some distance from here. With the exception of the workbench it is cluttered and dusty. The watchmaker is advanced in years and does not care about the state of the place, except for the area in which he works. It is a late afternoon in autumn, and growing dark. Quite cold, too. It is quiet. The workshop is dimly lit by candles, and the watchmaker – you can picture him in the gloom, bent over his bench, if you wish – is wearing several layers of clothing to keep warm. He is repairing a piece he made several decades ago, the prized possession of a local nobleman. It will take him perhaps half an hour, he estimates, after which he’ll lock up his workshop and walk through the narrow streets to his house, where since the death of his wife he lives alone but for an elderly and bad-tempered cat. On the way he will stop off to purchase a few provisions, primarily a bag of peppermints, of which he is extremely fond. The watchmaker. Not the cat. The timepiece he is working on is intricate, and very advanced for its time, though the watchmaker knows that were he to embark upon crafting something like it now he’d do things quite differently. He has learned a great deal since he made it. He doesn’t make anything new any more, however. He hasn’t in a long while. The story of his life has already been told. He is merely waiting for its final line. Nonetheless, his eyes remain sharp and his fingers nimble, and in fact it only takes ten minutes before the watch is working perfectly once more. He reassembles it, and polishes the outside with his sleeve. Finished. Done. He stands with the piece in his hands. He is aware, through his profound understanding of its workings, of the intricate mechanisms involved in its measuring of time, the hidden movements. He feels these as a subtle, almost imperceptible vibration, like the murmur of a tiny animal cupped in his hand, stirring in its sleep. And he is aware of something else. Not one thing, in fact, but a multitude – a cloud filling his mind like notes from a church organ, soaring up towards heaven. He is aware of children, and a grandchild. They cannot be his, because he has none: his marriage, though long and comfortable, was without issue. Aware, too, of the people who had come before him, his parents and grandparents and ancestors, aware not merely of the idea of them but their reality, their complexity – as though he has only ever been the soloist in the music of his life, supported upon the harmonies of others. He’s aware also that though the candles in the workshop illuminate small areas, there are patches of darkness too, and parts that are neither one thing nor the other. That his entire life has been this way, not forever pulled between two poles but borne instead along far more complex currents, of which ticks and tocks are merely the extremes. How did he come to be standing here on this cold after­noon? he wonders. What innumerable events led to this? He shakes his head, frowning. This is not the kind of thought that usually occupies his mind. He is not normally prey, either, to a feeling of dread – though that is what is creeping up on him now. Something bad is about to happen. He hears footsteps in the street outside. He half turns, but cannot see who is approaching. The windows are grimy. He has not cleaned them in many years. Nobody needs to see inside. His venerable name on the sign is advertisement enough, and as he has gradually withdrawn from the world so he has come to value the privacy the windows’ opaqueness confers. But now suddenly he wishes he could see who’s coming. And he wonders whether his life is over after all. He waits, turning back to the bench, busying his hands. No, no, no. Sorry. Stop imagining things. I’ve got this completely wrong. I’ve tried to tell the story from the beginning. That’s always a mistake. I’ve learned my lesson since, and have even come to wonder if this is what I was dimly starting to comprehend on that cold, long-ago afternoon. Life is not like a watch or clock, something that can be constructed and then wound for the first time, set in motion. There is no beginning. We are always in the middle. OK, look. I’m going to start again. This book is the first time i have read Michael Marshall Smith and i honestly didn’t know what to expect. What i found was such a surprise, the prose/ narrative seemed to match the plot, in that Hannah thought she was living a mundane existence until she found out her Grandfather had been friends with the devil for over 250 years. I found that Michael Marshall Smith played out his tale in a very matter of fact style, the normal, the every day and the mundane flowing along with the extraordinary happening as if we should almost not bat an eye, showing where the mundane is often so much more than that. 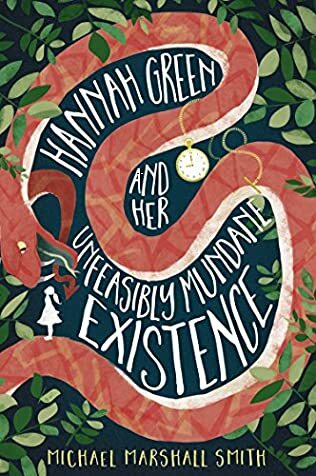 The story has a lovely endearing way of showing how a young girl can deal with all that life throws at her both in the ordinary and fantastical, how she and kids in general can be so adaptable. The characterization in this book is sublime and was a true revelation, something that will make me read more of this authors work, his effortless (seemingly) ability to portray and make his characters real and believable is the winner for this book. A fantastically dark and funny book that will leave you pondering it for some time afterwards.